A two-fisted take on the zombie genre.Like post-apocalyptic wastelands? Like zombies? 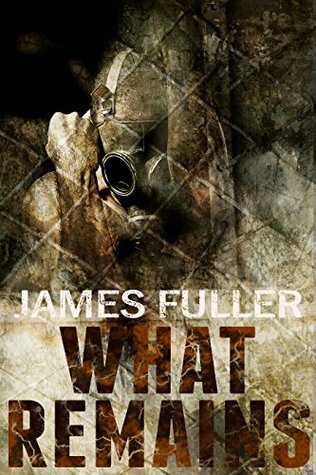 If you're a fan of Fallout and The Walking Dead, this is the book for you.The world has gone to hell in the years since the virus arose: resources are scarce, precious, fought over, killed for; mobs of mindless, hungry infected prowl every night; and the survivors have broken up into factions, clannish and hostile, trying to scrape by on what supplies they can find.In this world, Archer is a loner, a drifter. Snarky and self-centered, he's only out for his own survival until he meets Auska--a naïve, God-fearing twelve-year-old girl who just might have the means to save the world...There's plenty of action packed into this story: gunfights, gladiator-style combat, you name it. Humanity has become its own worst enemy, as the survivors left unscathed by the virus turn on each other instead of uniting against the infected threat.Archer is not a nice guy--he's callous, mouthy, and apparently uncaring. Yet he's sympathetic and likable, and as he gathers unexpected companions on his journey, the façade begins to crack a little, and you realize he's more attached to these people than he wants to let himself be. Auska, too, develops profoundly over the course of the story: she starts a frightened, innocent, sheltered child and by story's end has proven herself loyal, smart, resourceful and more capable than she ever imagined.Together, the two of them get into, and out of, quite a few harrowing situations. The action's lively, the characters complex, and the ending is an absolute punch in the gut. I'm eager to see how the story plays out in the next installment--my only quibble with the story is the proofreading mistakes that need to be ironed out. Good bookI enjoyed this book quite a bit. I can't wait to see what happens next. Mr Fuller brought the characters to life so that I could see them in my head. If you are a fan of apocalyptic tales, look no further. What Remains is sure to keep your attention and the title definitely explains it all. In this third person, action packed novel you will find a world already a decade into the zombie apocalypse. The narrative paints a vivid image of a world torn apart by disease and chaos, and how the society that once was no longer exists. It's a dog eat dog world, one that makes you wonder if there could be any hope left. The story is told in third person narrative following the main character Archer as he attempts to survive. Archer is one hell of a character. The middle-aged man has seen it all in his lifetime and was well equipped to make it in a world ran by monsters, zombie and human alike. He is callous, cold-hearted, and doesn't care about anything but himself and staying alive. With qualities like that it shouldn't surprise you that he is a loner. You understand him and why he chooses to make the decisions he makes. It's hard to trust people in the world we live in now, imagine having to live in a world where society doesn't exist and the word makes people laugh. That's a scary thought. But to Archer it's not. You do what you have to do to survive. If that means killing someone first and asking questions later, so be it. Although I have a feeling even archer wouldn't ask questions later. He'd just kill, scavenge, and be on his way to a destination unknown. Archer isn't a bad man though. Deep inside, he still has a conscience and it haunts him in his dreams. Having to watch him struggle with the person he has become makes Archer such a dynamic character.Archer's plans are thwarted though when he visits Silverton. He agrees to do some work for the head man in charge in exchange for some must needed supplies. Thinking it will be a fast job and he will be on his way, Archer ignores his gut instinct and agrees. He kicks himself later for it when twelve-year-old Auska follows him and talks him into helping her. She has never been alone and doesn't have the first clue of how to survive except to stay hidden at all times. The two embark on a journey to get her to Sanctuary, the place that will know what to do with the cure she carries. Along the way, soft-hearted Auska has to learn how to put her feelings aside in order to survive, and cold-hearted Archer learns what it's like to actually care for another person. The two forge a relationship of sorts that is extremely unlikely but works for them. They each give each other what the other needs, and it's heartwarming when pitted against the other characters they encounter. And they come across quite an array of characters with Archer constantly having to save Auska from whatever plight she has gotten herself into. Their journey quickly turns into running for their lives when the leader of Silverton, Blare, discovers that Archer has what he wants, the cure. Blare is a madman. One that you will enjoy piecing together as you read the story. The similarities between Blare and Archer will have you wondering why you like one but dislike the other. Believe me, you will enjoy peeling the layers off that onion. Blare is something else. If you are a fan of The Walking Dead just think of the governor. Enough said there. Archer and Auska do find people who want to aid them in their quest. In a world gone wrong, there are still people out there holding onto hope tightly. The ending is one not expected and will have you getting blurry eyed, if not shedding a tear or two. I can't wait to read book two to see where this story goes. One thing I love about zombie novels, besides the obvious being zombies, is the psychology of the way humans function. The humanity that is left when all else seems hopeless. James Fuller did an excellent job telling a story that seamlessly switched character view points, which is hard to do; building a descriptive believable world, and an ending that will surprise you and wanting more. There were only a couple of things I disliked about the book. One, I wish there had been a bit more zombie action. Two, for such a well written book it was a shame to find so many errors in it. Regardless of the two, this book is worth picking up and reading. The world's population has been decimated by a virus, that leaves people infected and crazy. The few survivors have become ruthless and wanderers, as everything falls into disrepair. Archer survives on his own, only interacting when he needs to trade. Auska is on her own, after her parents are killed, looking for sanctuary a safe place. Does she hold the cure for the virus! Archer reluctantly agrees to take her, to atone for a past failing. Good book, could have done with better proofreading. FantasticThis was honestly one of the best books I have ever read. I love all things zombie but this book was truly something special. It focuses on an amazing story with the zombie element just sort of bubbling away in the back round. A must read. Can not wait for book 2. Perseverance RemainsI really enjoyed this book because it not only deal with man's inhumanity to man but it also deals with man's compassion. The story lets you feel good about our struggle to survive never mind what's going on around you. This was a good book. I don't want to give anything away, but it didn't go in the direction I thought it would. I am looking forward to reading the next book in the series.